Hotel Commodore01597 822288work01597 825737fax HotelThe Hotel Commodore is situated in the heart of Wales, this stunning Victorian Hotel provides an ideal base from which to explore the beauty of Mid Wales, with the Brecon Beacons and the Elan Valley just a short drive away. 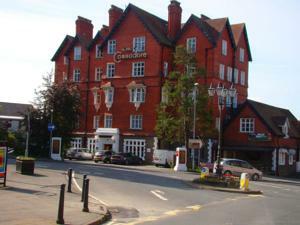 This grand Victorian building has been a hotel since 1886 and is within easy reach of all that Llandrindod Wells has to offer, including the spa waters, the beautiful lake and the rows of shops. Each of the Hotel Commodore's en suite rooms is individually decorated, with a traditional style. Spacious and comfortable, all of the rooms have TVs, telephones and tea/coffee. A traditional cooked Welsh breakfast is available every day. Why not enjoy a delicious meal in the Radnor Restaurant where you can be guaranteed a friendly welcome and warm congenial service. Our produce is locally sourced and regularly features on our seasonally changing menus. We require a £25 non refundable deposit for all UK credit card bookings. All None UK cards will be charged the full amount upon booking. A full refund on all non UK cards will be offered if bookings are cancelled withing 7 day of arrival, less then 7 days no refund will be offered.